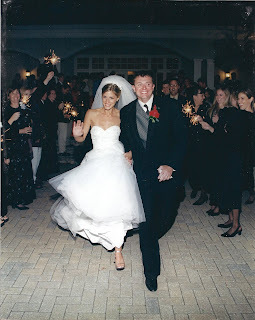 On the 11th of this month, Todd and I celebrated out 10 year wedding anniversary! 4 earthly babies, 1 heavenly baby, 3 infertility treatments, 5 houses, 1 business later ....I wish we could start back at the beginning so I could experience it all again! We had a book at our wedding for the guests to write well wishes or advice. I love to go back and read what everyone wrote, but my favorite is by my uncle, Rick. He wrote: "Todd, begin every day thinking how you will help Michelle that day. Michelle, begin every day thinking how you will help Todd that day." As I said in the 3 month post, Mary Conner has been trying so hard to roll over. She finally did last night! I missed it, but Todd saw her and said she looked surprised to be on her tummy! Our neighborhood yardsale was yesterday and at the last minute we decided to participate. We only lasted a couple of hours, but we got rid of lots of stuff. The kids had fun with their lemonade and cookie stand, even though it was a little chilly for lemonade.